An explosion of scientific publications over the last decades has increased the need of scientific review articles: Carefully crafted scientific review articles can provide the novice reader with an overview of a new subject and provide the expert with a synthesis of scientific evidence, insights on the reproducibility of published data and pooled estimates of common truth through meta-analyses. Unfortunately, while there are ample presentations and published guidelines for the preparation of scientific articles available, detailed information about how to properly prepare scientific review articles is relatively scarce. This perspective should provide a non-comprehensive summary of potential mistakes that I noticed as reviewer, editorial board member, teacher and reader. This reflection is primarily meant to guide authors to write high quality review articles, although readers could also use the provided information to identify existing review articles, which might not be as factual or reliable as presumed. I hope that this discussion will improve the quality of scientific reviews and thereby, increase the respective value of these articles for our scientific community. Review articles critically synthetize information from multiple original scientific articles on a well-defined topic with the goal to inform the reader about the current status of scientific evidence and its implications. Just as with original scientific articles, it is important to choose the topic of a review article carefully. Great review articles start with a clearly defined problem or question . Before getting started with a new review of any subject, it is important to conduct a thorough review of already existing review articles in order to prevent redundant work on an already investigated topic. Look for topics that have not yet been thoroughly reviewed, topics that warrant a re-investigation/update or topics for which you can outline a new question or new problem. A common mistake is to start with a pile of literature rather than a clearly defined problem or question . Examples of interesting topics could be a controversy between two or more competing theories/ approaches, review of a new discovery, progress of a new technology / scientific area, or a previously unnoticed problem. Evidence-based clinical studies use the “PICO” technique for framing a clinical question with reference to Patient/Population, Intervention, Comparison and Outcome. An example would be: In patients with neuroendocrine tumors (P), do theranostics (I) achieve improved outcomes (O) compared to standard chemotherapy (C)? There are at least 14 approaches to organizing the scientific literature . Common types of review articles are the literature review, a qualitative summary of a given topic, and the systematic literature review, a more comprehensive evaluation of the primary research literature on a specific question. Irrespective of the type of review, it should follow a clearly outlined topic and structure. Care should also be taken in accurate reproduction of figures from original research articles. Reproducing only part of an original figure or combining figure parts from two or more different articles into a new figure can perhaps inadvertently maximize the scope of the author's preferred hypotheses or lead to entirely new, and perhaps un-validated conclusions. For example, in the area of theranostics, it should be avoided to reproduce an MR image from one article with histology data from an entirely different article, because it could lead to false conclusions that the two are in any way related. A review article should not only consist of a collection of articles, but also provide an organized overview of the methods that led to the assembled literature along with a critical analysis of the collected data and the bigger lessons being taught. Flow charts and graphics are useful to clarify the selection pathway and provide a comprehensive overview about which and how many articles were excluded or included in the review (Fig. 1). A literature review that spans a long time interval can be accompanied by a timeline that shows the historical sequence of events/development. It is useful to focus on one idea or discussion point per paragraph and avoid discussing only one study per paragraph. Synthetize information obtained from several studies by critically reviewing one common topic of several articles. If the selected articles contain quantitative data that lend themselves to statistical analyses of pooled data, then a meta-analysis can be performed. For a meta-analysis, the underlying statistical analysis should be described in detail and results can be displayed in tables or charts as deemed appropriate . Individual studies are assigned a weight based on the sample size and conclusions are reported based on accuracy and precision of individual studies' results. The PRISMA (Preferred Reporting Items for Systematic Reviews and Meta-analyses) guidelines provide a 27-item checklist to improve the quality of meta-analyses and can be further enhanced by open registration of systematic literature reviews . 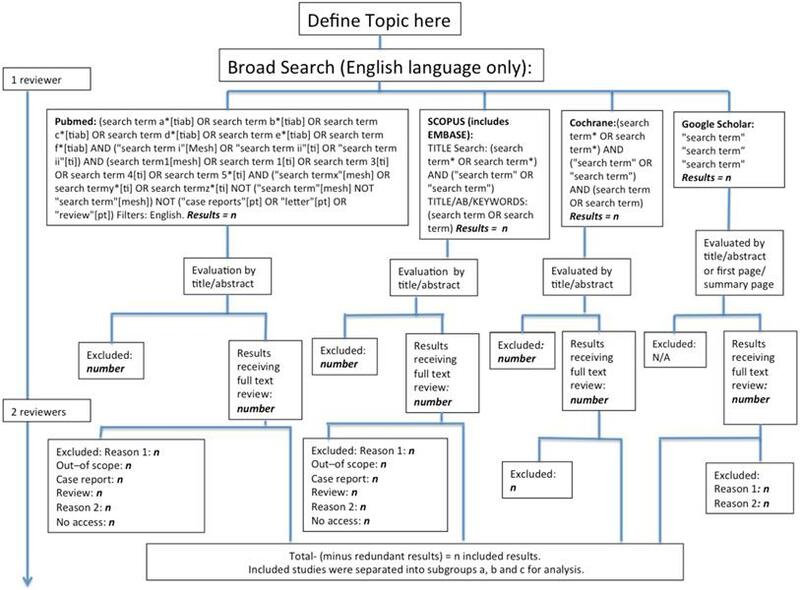 Example of a flow chart for reporting a systematic literature review: It is important to define the overall search topic and language. Different databases are accessed through well defined inclusion search terms, exclusion search terms and well defined article type(s). The initial selection of articles by key words is usually computer based and can be easily reproduced by any other researcher. Therefore, computer-based searches usually only require one reviewer. For search terms, consider synonyms, singular/plural forms, adjectives and different spellings, among others. Use Boolean search operators such as AND, OR or NOT to broaden or narrow the search. Medical subject headings (MeSH) in the Medline database can be searched to find articles on a specific life sciences subject. Use truncation symbol "x" or x*, depending on database, to find words with variable endings (e.g. "parent" or parent* will find parent, parents and parenting) and wildcard symbol for variable characters (e.g. wom#n for woman and women). Use parentheses for searches that should run first. Whenever a manual selection process is involved, at last 2 reviewers must perform this selection independently. Results of both searches are included in the subsequent assessment, including overlapping and non-overlapping articles. This avoids selection-bias. Inclusion and exclusion criteria should be defined before starting the review and results should be documented such that another researcher using the same criteria would arrive at the same result. The search can be registered with PROSPERO or similar online platforms to document that it did not deviate from its pre-defined criteria. Key features from the review protocol are recorded and maintained as a permanent record. A great review consists of a clearly defined topic, carefully collected key articles, a discussion of the main areas of scientific debate, a summary of unsolved questions and a critical appraisal of implications for the field. One possible approach is to organize a review article similar to an original scientific manuscript : (i) Start with background information and define the problem or gap in knowledge (the introduction). (ii) Clarify the review type, scope of review and methodological approach (similar to a methods section of an original scientific article). It can be helpful to provide a flow chart; (iii) Next, review the research articles on the chosen topic. (iv) Critically appraise relationships, commonalities, confirmations, gaps and inconsistencies between different studies, along with a discussion of implications for the field and needed next steps. Point (iii) and (iv) can be intertwined as long as citations and discussions/interpretations are clearly defined. It is important to follow a clearly defined, thorough methodology and limit reported facts and conclusions to those supported by the review. Review articles provide an increasingly important means to organize and synthetize an exponentially increasing number of scientific publications. Writing a great review article is an art, which is largely dependent on the time, effort and expertise of junior authors, expert advisors, reviewers and journal editors. The scientific community will surely benefit from authors taking the points above into consideration. Corresponding author: Heike E. Daldrup-Link, MD, PhD., H.E.Daldrup-Linkedu; Department of Radiology, Stanford University School of Medicine, 725 Welch Rd, Stanford, CA 94305-5654, USA. Ph: (650) 497-8601; fax: (650) 725-8957.